New items are in the store. Come in and browse. Some items are 30 to 50% off. Everything You Need For A Day Of Fishing...and More! Our marina store offers a wide variety of items. We sell everything you need for a day of fishing- gas, tackle, bait, oil, paper towels, sunscreen, soft drinks, beer and snacks. You can purchase a Coastal Recreational Fishing License or you can obtain it online at www.ncfisheries.net/recreational/NCCRFL.htm or by clicking on the Marina Store photo above. We openly welcome you to come in during your stay and browse our wonderful gift shop. We offer an array of unique nautical jewelry; dishware, candles, stationery, beach bags and sunglasses are among the many items we carry. Many anglers find that our statues, wall art and lamps are an inventive way to commemorate their prized catch just as well as taxidermy, without the hassle or expense; our art features many of the fish caught offshore can be purchased or special ordered. Clothing items include t-shirts, sweatshirts, hats and visors for men and women. What trip would be complete without one of our notable designs to take home and show off what you caught on your fishing adventure? Our children’s corner has books, stuffed animals, beach toys and oceanic videos. We also have kid’s t-shirts and sweatshirts. 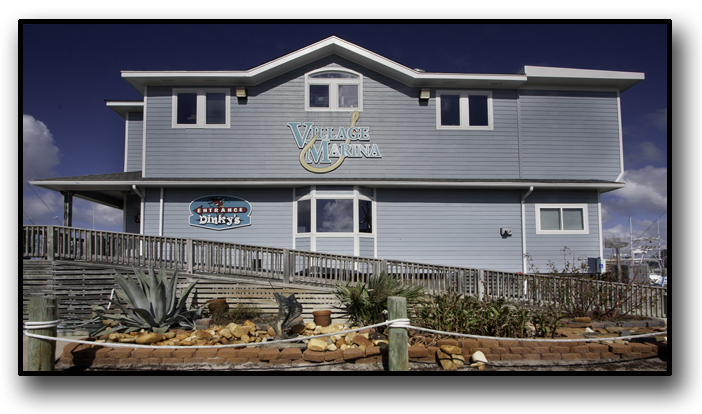 So whether you are an accomplished angler, a discriminating shopper with exquisite taste, or you just love to come to our serene beaches, we can guarantee that we have a little bit of something to tantalize you here at Village Marina and Motel. Store hours are 5am to 7pm from Memorial Week to Labor Day. Hours will vary during the remaining months. Contact us at 252-986-2522 or e-mail us at villagemarina@embarqmail.com.